Within this specially-designed Homework Louisiana Resource Center, you will find everything you need to promote Homework Louisiana in your community. Each section, accessible from the links at the top of the page, contains pre-designed promotional materials that will help you build awareness of this service. 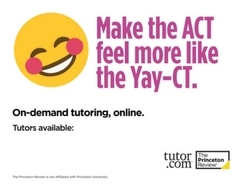 Also, the Tutor.com Client Care Team has included best practices and guides for each stop of the way. If you ever find yourself in need of help, please contact us right away. We can help you build a marketing plan, customize material in different formats or demonstrate the service to patrons. Just reach out to your Client Service Manager, Susan Del Rosario via phone at 920-327-2859 or email at Susan.DelRosario@tutor.com. Click to download a zip folder of materials. SAT® is a trademark registered by the College Board, which is not affiliated with, and does not endorse this product. ACT is a registered trademark of ACT, Inc. The Princeton Review is not affiliated with Princeton University.